In Flokzu, users who are Administrators or Business Analysts can create databases to use in their processes. Store information that will be repeated in several processes (e.g. a list of countries, a list of products, Supplier&apos;s contact details, etc.). You can use this information to populate the options of a combo box in a form. If you want to add a new country, product or supplier, you can simply add the record to the database and all related combo boxes will be automatically updated. Represent hierarchies, e.g. to automatically assign tasks to a user&apos;s supervisor. Unify information of several process instances and access it from one sole spot, e.g. for each purchase that has been approved, you can create an automatic record in a database. Then to access all the purchases, you can look up in that database, without the need to enter each process instance. Summing up, databases in Flokzu can be used to send information towards a process or to store information from a process. Administrators and Business Analysts can set the configuration of a database, specifying its columns (the attributes he/she wishes to store), the type of field for each column, which users are allowed to access and modify the database records, etc. Only Administrators can remove a database. The id column can&apos;t be removed; it consists on an auto-incremental number for each database record. It is selected by default as the database primary key, but if you want you can choose any other column (the value chosen must be unique for each database record). Users that have access to at least one database (by having at least reading permission) will view the &apos;Databases&apos; item in their leftside menu. It will remain hidden for the rest of the users. After you have created the structure of your database, click on the &apos;Save settings&apos;. 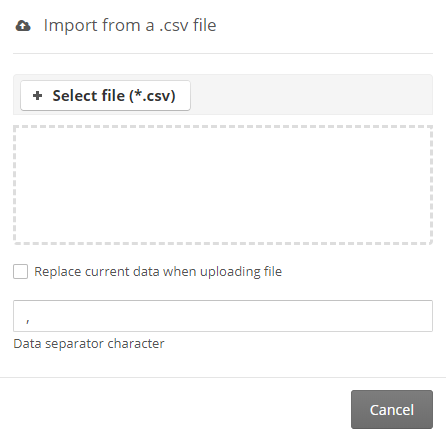 In order that the import can be done successfully, the first row of the CSV file must contain the names of the columns and the data must appear from row No. 2 onwards. The column name must match unequivocally the name that you have entered in your Flokzu database, paying attention to upper case and lower case letters and special characters. Only the data from existing columns in Flokzu will be imported to your database. If there are any columns that weren&apos;t included in your Flokzu database, the data from these columns won&apos;t be imported. Once you have imported the file, remember to save the changes.